This easy Cajun Chicken Pasta comes together in just 10 minutes, you don't even need to boil the noodles! With just 10 minutes of prep, you can serve an easy, one-dish dinner that your family will love! 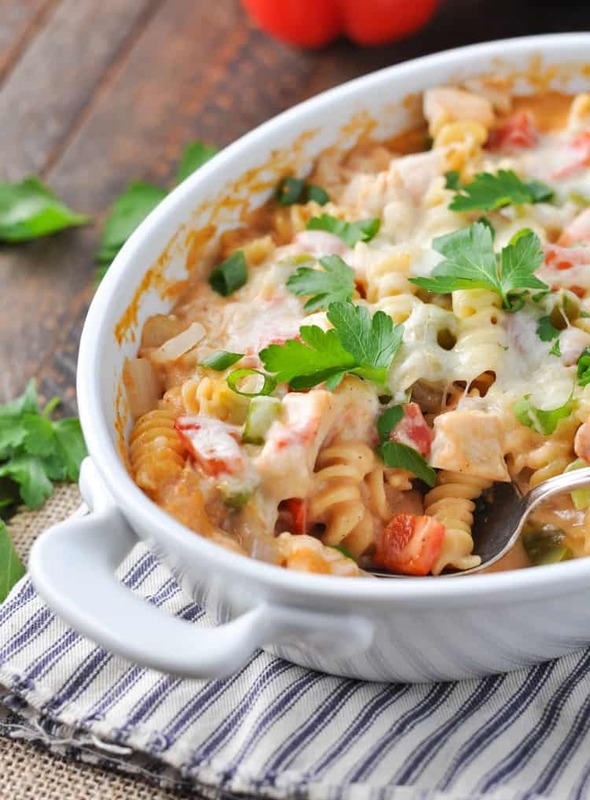 This creamy Dump-and-Bake Cajun Chicken Pasta is so fast because you don’t even have to boil the noodles! After sharing my Dump-and-Bake Shrimp Ettouffee a couple of months ago, I was reminded of that delicious combination of flavors. 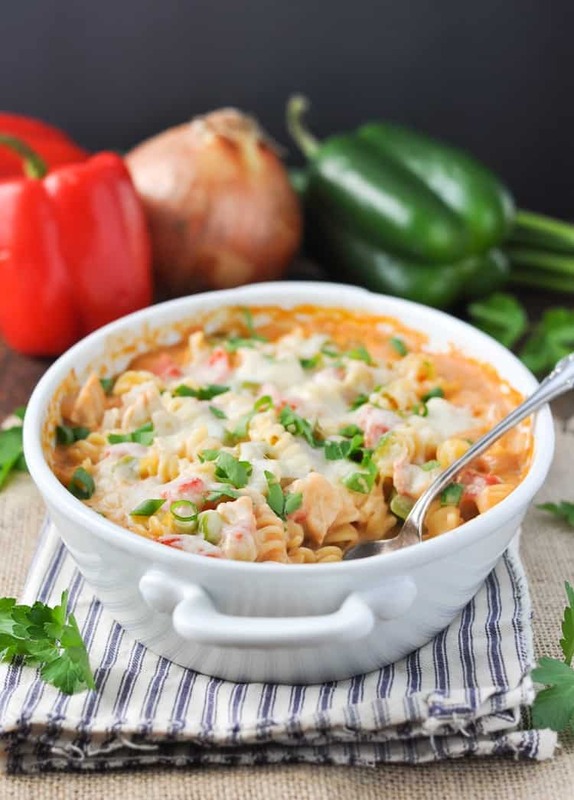 Seriously, is there any better blend than bell peppers, onion, garlic, and tomatoes in a rich, creamy, and spicy sauce?! 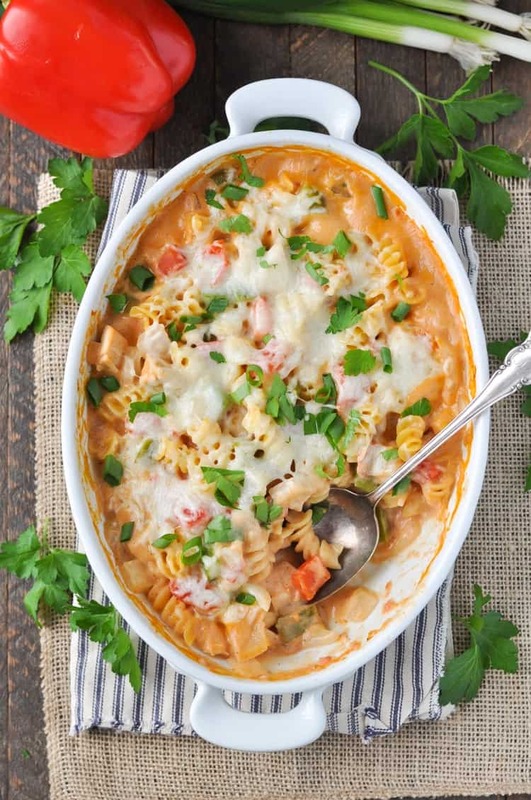 Cajun Chicken Pasta is one of those meals that reminds me of American chain restaurants. I’m pretty sure that places like Chili’s, T.G.I. Friday’s, and Applebee’s all have their own version. It’s obviously a very popular dish, but it’s not something that I had ever thought to make at home on my own. Too complicated? Too many ingredients? Too time consuming? The great benefit of making your own Cajun Chicken Pasta at home, though, is that you can completely control the ingredients. You can use whole wheat pasta, you can add more (or less) garlic, you can load it with extra veggies, and you can make it as spicy (or as mild) as you like! That’s why I was so excited when I figured out how to make this amazing meal accessible for weeknight dinners. With my favorite Dump-and-Bake method, I’m able to pull together a family-friendly one-dish meal that offers maximum flavor for minimum effort! At the end of the day, we’re all just looking for simple meal solutions that make dinnertime quick, easy, and delicious. With a variety of nutritious vegetables and plenty of protein, this stress-free supper minimizes chaos at the end of the day so that you can take a deep breath, focus on what matters most, and enjoy a homemade dinner with your loved ones! Cooking for Two? You can easily cut the ingredients by 1/4 to get two small servings of the pasta dish. For instance, just use 4 ounces of uncooked pasta, 6 ounces of Alfredo sauce, 3/4 cup of chicken broth, 1/2 cup diced chicken, etc. Bake in a small dish (about 5 x 6-inches) if you have one, or divide into two single-serve dishes. The cooking time will be slightly shorter, but not by much so keep an eye on it! This is a great way to use up leftover roast chicken or turkey. You could add extra veggies to it that need using up such as broccoli and zucchini. 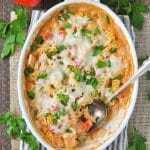 In a large 13 x 9-inch baking dish, stir together uncooked pasta, Alfredo sauce, chicken broth, chicken, undrained tomatoes, bell peppers, onion, Cajun seasoning, and minced garlic. Cover tightly with aluminum foil and bake for 35 minutes. Once pasta is al dente, sprinkle cheese over the top. Bake uncovered for 5-10 more minutes (or until cheese is melted and pasta is tender). Garnish with parsley and sliced green onion, if desired. 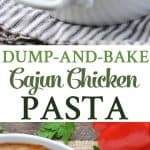 I love the sound of cajun chicken pasta! I’ve never made my own before, but you’re right, a lot of restaurants do have their own version. This dump and bake one sounds perfect for that kick of flavor when you’re short on time! My family loves spicy food. 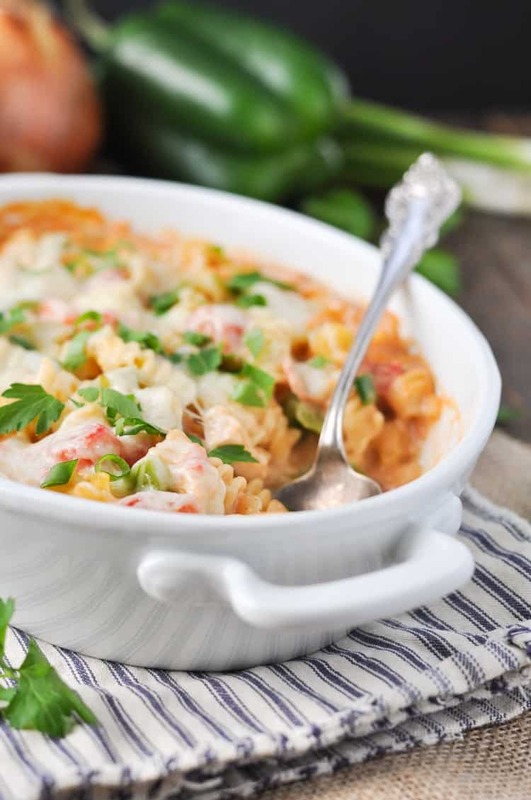 This looks like a super easy dinner to make on a busy night! You’ll love this version, then! Thanks so much, Ann! Enjoy! I tried this recipe and though it was delicious, the sauce turned out thin and runny. Your photos how the sauce to be thick and creamy. Any idea what I might have done wrong? I’ve tried and enjoyed many of your recipes. Hi, Dennis! I’m not sure — did you use penne as called for, or did you substitute with a different pasta shape? Was the pasta cooked through, or did it still need more time to finish absorbing some of the liquid? I can’t think of any other variables that would have affected the consistency of the sauce, so I’m not sure what the problem was. Sorry I don’t have a more specific suggestion. Thanks for reading the blog! I appreciate you following along with us! Have a great weekend! 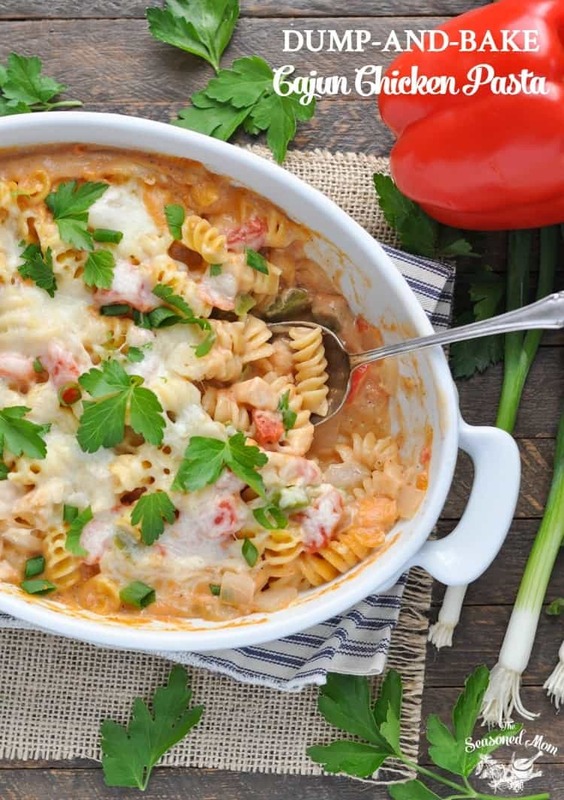 Can you boil and cook pasta before baking or will they be too mushy? Hi, Robin! Yes, you can definitely pre-boil the pasta in the same way that you would for a more traditional casserole. That said, you’ll have to adjust the amount of liquid that you use in the dish. When you bake the UNcooked pasta, the pasta absorbs a lot of the liquid as it bakes. If you’re starting with cooked pasta, I would suggest eliminating most of the chicken broth (maybe just set aside a little bit to thin the sauce, as necessary). Hope that helps, and enjoy! This has become my go to pasta during the week ! So easy to make. Thank you for sharing . Great recipe! Could you prep it all then freeze it? Or would it need to be cooked first before frozen? Hi, Karleigh! You can freeze it either way — before or after baking. If you freeze it before baking, the pasta may have a slightly mushier texture after baking, but it will still be okay. Enjoy!